It has become more and more evident with time that the health care delivery system here in the United States is riddled with issues. One with many disagreements arising from the fact that there is no clear and universally acceptable solution to our problems. In many ways, the system seems to step on its own feet — as the health care professionals working within it fight to make it work the way it is intended or find themselves at odds with their own professional principles. This dysfunction amounts to what Dr. Atul Gawande calls a “giant conundrum.” Much to our chagrin, the shortcomings of our system are much easier to identify than its strengths. For example, the United States leads the global pack in spending more per capita than any other developed country. This fact requires virtually no mention on account of how pervasive the topic has become in political and civil discourse. It is also well known that our country consistently fails to show a commensurate increase in the quality of health care outcomes, which include such metrics as life expectancy and infant mortality. Fortunately for all of us, there is hope on the horizon: providers are exploring different models of health care delivery, including several patient-centered models and testing them for utility under current payment schemes. I became well acquainted with these models, as well as the economic and health-related benefits many of them offer while doing research between my first and second years of medical school. What I learned from the experience is this that there is actual hope. I observed firsthand how emerging health care delivery models, such as telemedicine and patient-centered medical homes (PCMHs), can directly impact patient care in the primary care setting. This past summer, I was working on a systematic review of the role of primary care in providing genetics services to underserved populations. The review focused on a number of elements including genetics-related literacy among primary care providers, delivery of genetic services, barriers to the provision of genetics services in the primary care setting and primary care support and integration strategies. The reality that many patients, particularly those in medically underserved areas, lack access to specialty care is what prompted our investigation into what is being done on the primary care front to compensate for the lack of access to clinical geneticists and genetic counselors. We discovered that primary care providers feel unequipped to offer genetics services across the board. While much progress has been made in improving access to and knowledge of genetics services, substantial gaps remain in the delivery of these services to medically underserved populations. There are many ways to explain these observations. One of the most important factors is that many clinicians state that their education in genetics was not sufficient to prepare them to provide services to their patients. Despite an increasing awareness of genetic disorders, there remains a lack of practical genetics knowledge, appropriate approaches to testing and methods for patient education among primary care providers. As a result, many patients may receive unacceptably delayed diagnoses or may be misdiagnosed. Underserved populations are particularly susceptible to this knowledge gap because they generally lack access to specialty services and have to rely on primary care providers. This knowledge- and resource-based quandary creates a lose-lose scenario for patients and providers located in underserved communities because overwhelmingly those providers are unable to give their patients the means to achieve good health outcomes. Fortunately, promising solutions to these problems lie in connecting primary care providers with providers who are experts in their respective fields. From both a financial and logistical standpoint, it is not practical to physically place specialists in many underserved communities. Therefore, any connections between specialists and primary care providers must be made remotely. Modern technologies offer the indispensable option of spanning the vast distances that can separate primary care providers and specialists. When applied in the context of medical care, this approach is called telemedicine. Telemedicine technologies have been studied extensively, and several research efforts have demonstrated the cost-effectiveness and ease of application of telemedicine. One prime example of telemedicine in action is Project ECHO, an initiative conceived by researchers at the University of New Mexico School of Medicine. 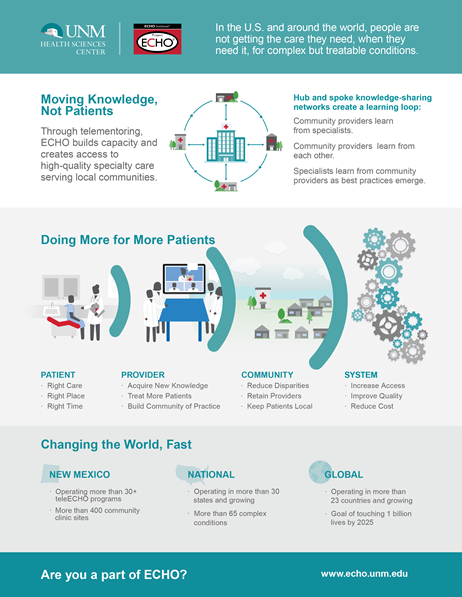 Project ECHO was originally designed as a hub-and-spoke model in order to address the alarmingly low rate of hepatitis C diagnoses in rural New Mexico. Although it is a well-studied approach with many potential benefits, telemedicine is not the only way to go; other solutions do exist. One such solution that is quickly gaining acceptance in the medical community is the PCMH model, a format of health care delivery in which multiple health care services are collocated in order to promote better coordination, continuity, and quality of care. Besides the potential benefits of improved health outcomes, PCMHs also provide the direct benefit of lowering overhead costs for different health care professionals, including physicians, and lowering the cost of care passed on to patients. Although the initial investment in setting up a PCMH can be large, the payoff from both ethical and pragmatic standpoints, later on, provide more than enough justification. In addition, PCMHs allow for primary care providers to directly collaborate and consult with genetic counselors and/or clinical geneticists on specific cases because the lower operational costs and improved access to patients make it more practical for specialists to work in less populous places. In this way, PCMHs offer some of the same benefits that telemedicine strategies do. These findings indicate that a new age of health care delivery is upon us. We only need to continue to expand what already exists in order to tip the scale on our health care expenditures versus our health outcomes. As someone who aspires to be a family physician, I am given a deep sense of satisfaction that my future practice of medicine will very likely be enhanced by the support of a team of health care professionals. Ashten Duncan is a medical student. < Previous post Am I properly trained for grief? Next post > Physicians have had it. What do we do now?